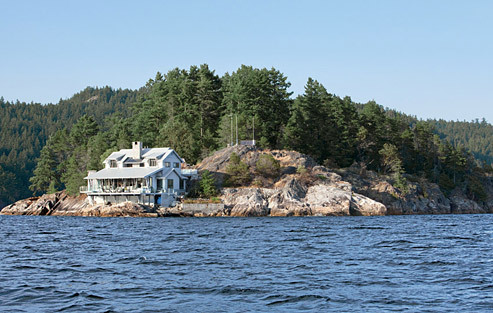 Living by the water is the ultimate luxury. The most enticing retreats are always designed to take advantage of the landscape and the view. 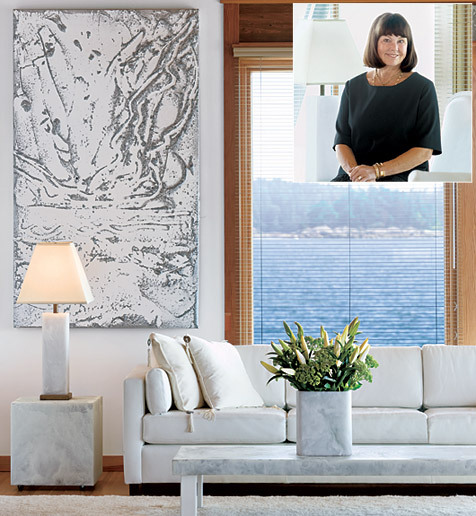 I was thrilled earlier this year when Architectural Digest featured the stunning cottage of Canadian designer and artist Martha Sturdy. 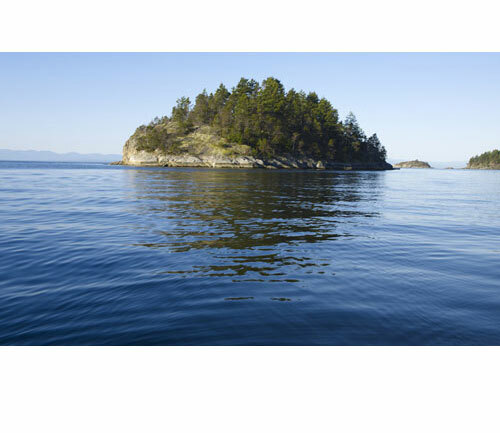 Preston Island is 20 miles northwest of Vancouver. Martha’s 5 acre retreat looks onto the Strait of Georgia. The talented and original designer is also a grandmother and an animal lover, so her homes are always designed for real life. She understands the wear and tear a well-loved home faces. Martha’s inviting retreat showcases her skill at mixing materials and layering textures. 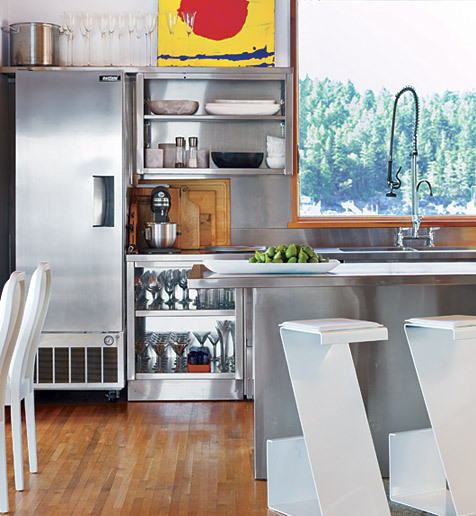 The designer’s modern take on cottage living is warm and inviting. Martha is well-known for her creative use of natural materials like brass, steel and synthetic resin. 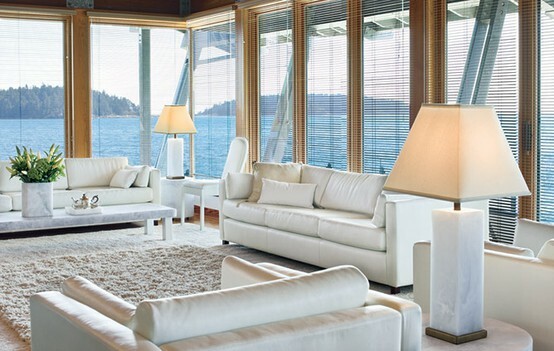 She used white leather upholstery and resin furniture to create a serene and luxurious space. A versatile artist, Martha also created the wall sculpture — so beautiful. I love the lights. They remind me of planetary models. 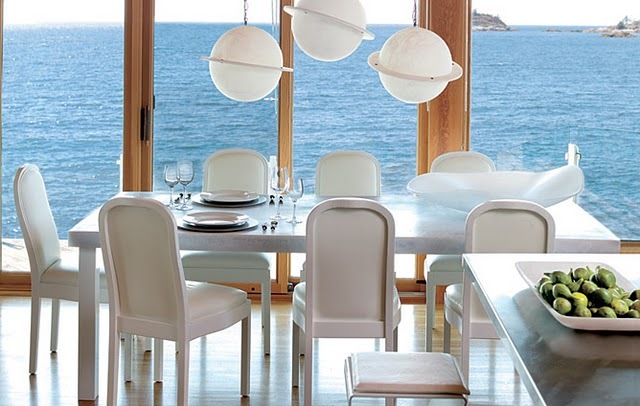 Can you imagine a twilight dinner at Martha’s place? I don’t know how Martha was able to build so close to the shoreline, but the effect is spectacular. It must feel like a boathouse. 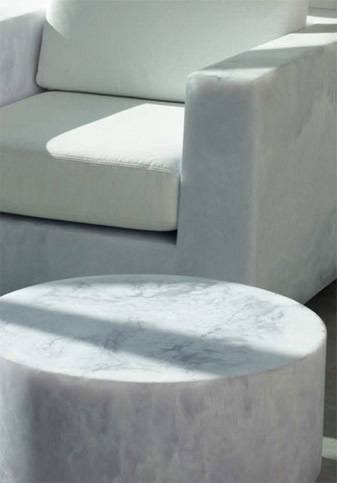 Martha is known for the range of colours in her resin furniture and accessories collection, yet white seems to be a favourite. It has a surprising warmth and works beautifully in her cottage. To learn more about Martha Sturdy’s work you can read a post I wrote on her here or check out her website here. Photography by Laurie Black for Architectural Digest.